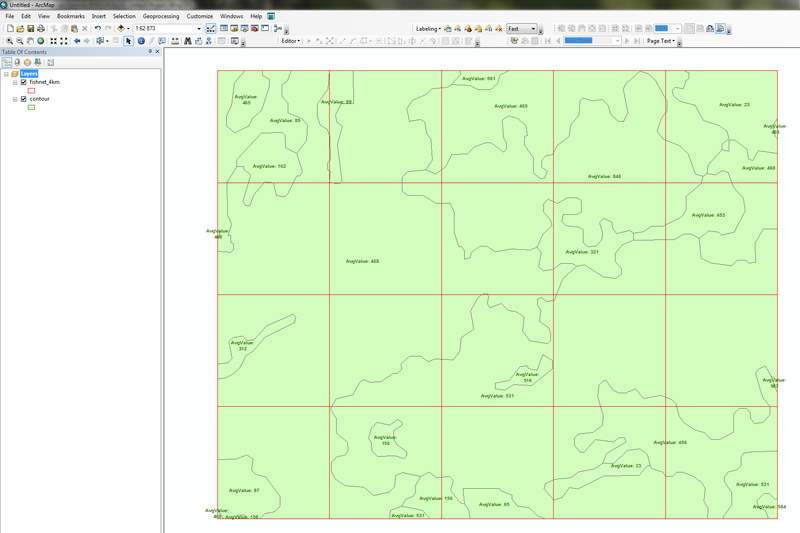 I am looking to assign depth values to each fishnet grid cell that I have by taking the area-weighted average of values from a contour/isopach map. The map was interpolating using the depths of individual wells using the Geostatistical Analysis tool Inverse Distance Weighting. Attached see a picture of my example along with the attribute table. At first I thought that Zonal Statistics as Table tool would be perfect but it would require me to convert to raster first (or even change the output of the IDW tool) but I have read that the conversion to raster is a poor choice (Does IDW interpolation in ArcGIS Geostatistical analyst work as exact interpolation method?). Is there a better method? The tool you need is Tabulate Intersection. You'll need to use a pivot table to transform the outputs to have one record per cell, and then join these results back to your fishnet feature class. The process is documented on the link above. If I understand well, you should use the raster output of your spatial interpolation and zonal statistics if you want the most precise output. 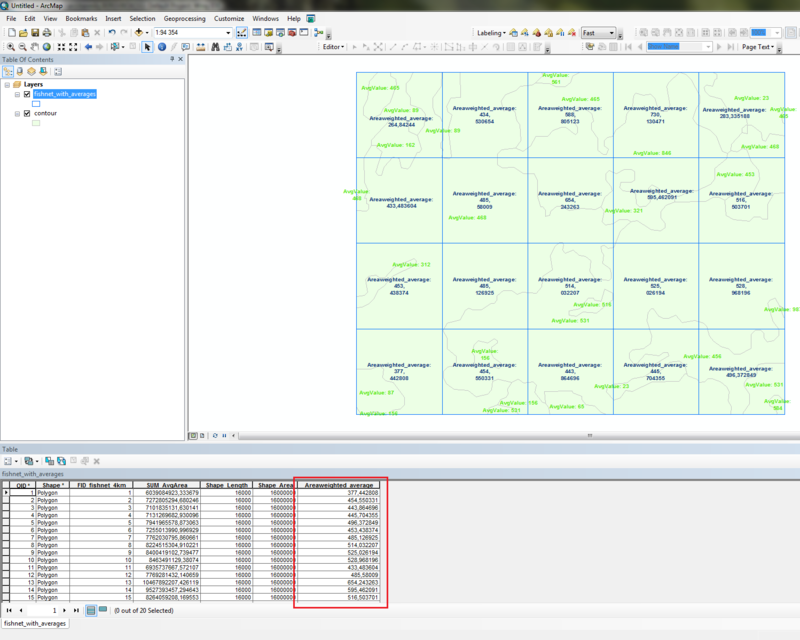 Don't be afraid with the discussion about exactness in Does IDW interpolation in ArcGIS Geostatistical analyst work as exact interpolation method? . Statistically speaking, an exact interpolator is an interpolator where the interpolated value at the location of an input point is exactly the same as the value of this point. The answer then says that you are rarely exactly at the same location when you have pixels, therefore you will not have exactly the same value for a pixel and the "known" point that is inside this pixel (except in the center). However, the continuous surface that is interpolated is always measured at the center of each pixel, which are then "exact" with respect to the interpolator. Pixels are therefore a good way to discretize an interpolated surface, and far more precise than polygons in your particular case (the hexagon is probably a circle that is simplified with 6 segments). Not the answer you're looking for? 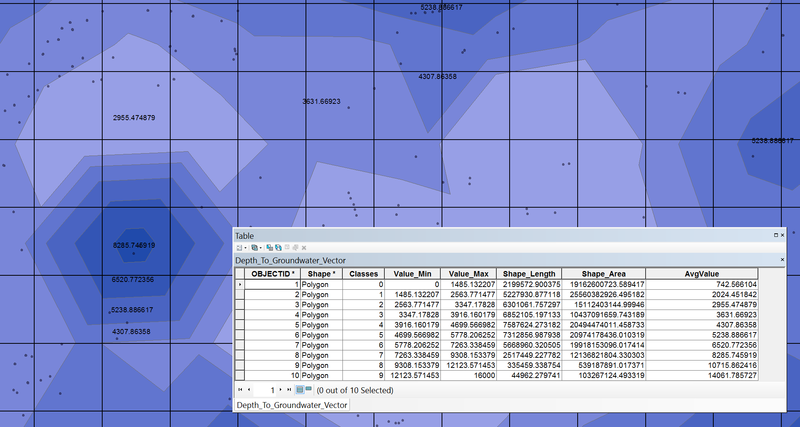 Browse other questions tagged arcgis-desktop polygon vector-grid geostatistical-analyst or ask your own question. Null values using Extract values to table with ArcGIS?